China, Korea, Japan, ASEAN, Russia, USA, Canada, Mercosur, Australia, South Africa, the Near and Middle East region… On June 9th, COSMED and Business France organize an event devoted to the international regulation of cosmetic products with regard to cosmetic claims. Experts within cosmetics exporting industries will be able to interact with regulatory experts, obtain key information to export in full compliance, share their experiences and anticipate regulatory developments in the areas where their products are marketed. Export advisors from Business France will tackle the lead markets, opportunities and pitfalls to avoid. 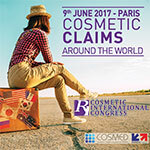 Furthermore, acknowledged speakers will present the regulation of cosmetic products along with the latest developments. Mr. You Sang Won – GRC (Global Registered Certification) – will explain how the claims in South Korea determine the product classification, provisions which was recently modified by the publication of a new regulation in January 2017. Dr. Masato Hatao, Director for Safety & Science – Japan Cosmetic Industry Association (JCIA) – will shed the light on the positive list of claims for cosmetics. Mrs. April Guo, Cosmetics Regulatory Affairs Manager – CIRS – will present cosmetic regulatory new requirements including the implementation of the new Safety and Technical Standard and will provide an overview of the various claims that determine product categories. Mr. Mohammad Azroul, Senior Conformity Assessment Specialist – GCC (Gulf Council Cooperation) – will present the latest regulatory updates on cosmetic claims including the publication of the new standard imposing the 6 common European criteria in the GCC countries along with a list of examples of acceptable or unacceptable claims. National specificities will also be summarized.